The Reformers viewed the gospel as not merely one thing among many in the life of a church but rather the means by which the church exists. When the gospel is rightly declared and applied to God’s people, the church becomes “a creature of the Word.” She understands, embraces, and lives out the reality of Christ’s birth, life, death, and resurrection in more than her doctrinal statement. The gospel impacts all the church is and does. 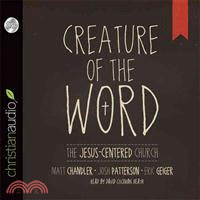 Creature of the Word lays out this concept in full, first examining the rich, scripture-based beauty of a Jesus-centered church, then clearly providing practical steps toward forming a Jesus-centered church. Authors Matt Chandler, Eric Geiger, and Josh Patterson write what will become a center-ing discussion piece for those whose goal is to be part of a church that has its theology, culture, and practice completely saturated in the gospel.